Pro Android 5 shows you how to build real-world and fun mobile apps using the Android 5 SDK. 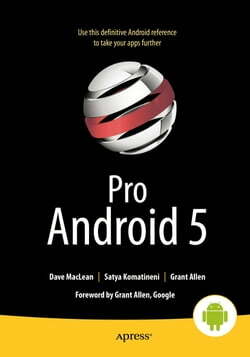 This book updates the best-selling Pro Android and covers everything from the fundamentals of building apps for smartphones, tablets, and embedded devices to advanced concepts such as custom components,... read more multi-tasking, sensors/augmented reality, better accessories support and much more.Using the tutorials and expert advice, you'll quickly be able to build cool mobile apps and run them on dozens of Android-based smartphones. You'll explore and use the Android APIs, including those for media and sensors. And you'll check out what's new in Android, including the improved user interface across all Android platforms, integration with services, and more. By reading this definitive tutorial and reference, you'll gain the knowledge and experience to create stunning, cutting-edge Android apps that can make you money, while keeping you agile enough to respond to changes in the future.